Market Manila - Citrus-ade Plus a la Marketman… - Other Food Products, Kitchen Equipment, Etc. After hitting the market at 6am this morning, I returned home laden with produce, and sweating something fierce. As we tried to clear out some old items in the fridge to make way for the new arrivals, I noticed a lot of citrus fruit, plus had some small strawberries from baguio, so we made a pitcher of citrus juice (lemons, oranges and grapefruit (the last one, banished from our house for now due to problems with my statin medicine) to enjoy throughout the day. Amazing how fresh fruit juice is so incredibly refreshing compared with say, a canned soda. And I LIKE my canned sodas! 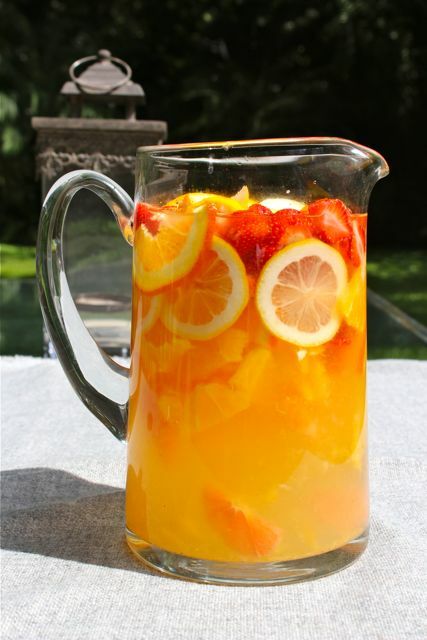 Into a pitcher, I added the juice and slices of say 6-7 lemons, 2-3 oranges, one grapefruit and half a pint of small baguio strawberries. Added some cold water, a few tablespoons of simple syrup (sugar + water, heated and allowed to cool) and mixed it all up. Taste and adjust either amount of fruit or syrup to your liking. Serve by pouring into large glasses FILLED with ice and add some fresh mint if you have it. I learned a trick last night from a cooking show on TV, take the mint leaves and crush them up and place them in your palm and clap once vigorously… the abuse will help the mint release its essential oils and fragrance. Keep the pitcher in the fridge, you may actually add water for a weaker tasting “ade” later in the day… Currently enjoying a glass of this citrus-ade while having a serious “conversation” with our now “67” year old chocolate labrador who is complaining that they haven’t created little airconditioned rooms that would be perfect for her to snooze in… she is feeling the heat too. :) Stay cool, everyone. Beats the summer heat truly refreshing and yummy! The ‘it feels like… (41 degrees)’ is called a heat index apparently – kind of the opposite of a wind chill factor I guess. Have taken to munching on refrigerated oranges to help hydration. Your cocktail’s a good idea, will be adding a few things to my list at the Sunday market. WOW!!!!! Gusto ko niyan please…..
Another Hallmark card photo, MM..I’d give up the internet for air conditioning, too..will have to invest in a good generator soon. Retirement is just around the bend..
How about just squishing the mint with your fingers? Maybe clapping vigorously will just make you more pawis!…too much energy expenditure!!! !..just kidding! I feel for you guys and yr	beloved labrador, I was there last February and I felt the heat,too. It was 26 degrees. I drank lots of mango and coconut juice and lots of Razon’s halo-halo :D MM,yr citrus-ade looks yummy! MM, I am LOL right now because having traveled around the world for the last 24 years, I have finally settled down here in Cebu, and I posted on my FB page that it was 90 degrees F, but with a heat index of 107…just wish I had your refreshing drink today! Tomorrow is Sunday and the Family is coming over, think I will copy your recipe…and hopefully accolades will follow, and a thank you to MM will be toasted! You know what else you can add to your citrus ade? …Rhubarb compote! It is rhubarb season here now, MM…I got about 8 stalks from a neighbour’s garden hoping to make it into strawberry-rhubarb pie later but instead made rhubarb compote(with a pinch of cinnamon, vanilla pod, orange zest, sugar, juice from 1 orange) …than added it to cold freshly squeezed orange juice….ANG SARRRAP! a real thirst quencher, too!!! 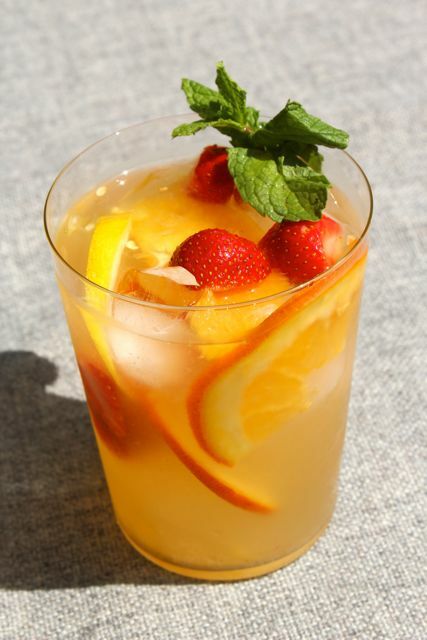 !…I think next time, I will make rhubarb compote ice cubes and add it to the pitcher with freshly squeezed orange juice and sliced strawberries…I AM SO MAKING THIS IN THE SUMMER WHICH IS JUST AROUND THE CORNER! Poor chocolate Ginger. My choc lab has taken to swimming apparently. I won’t see him till July. Perhaps they could have a play date…? Nice! Perfect for a sunny day like in the pictures. A nice sunny day is also perfect for great outdoor grilling. Inihaw na liempo anyone? That really looks pretty and refreshing. Will have to wait till temperature rises to make that as it is still sweater time in our neck of the woods. Would have to hold off on the grapefruit though as it will conflict with my medication for hypertension. I was told even pomelo or “suha”, which is a cousin of the grapefruit, is bad. Tragic really because I can devour a whole pomelo in one sitting. 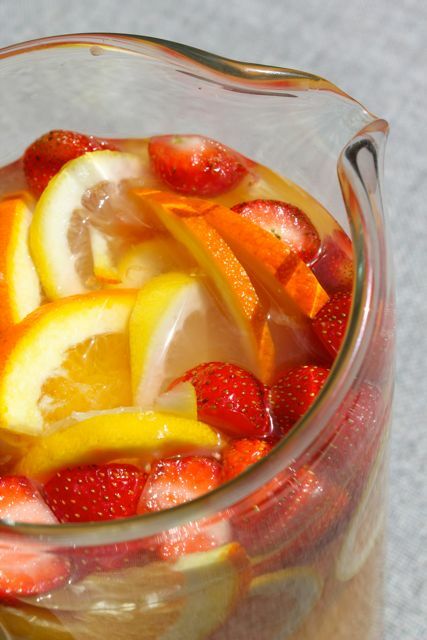 What a colorful and refreshing drink! Our beloved four-legged family members feel the heat of the summer worse than we could imagine. They don’t sweat and only release heat through their foot pads, by panting heavily and sometimes lying down belly up. Since the start of the summer, I instructed the nanny (hehe) of my very furry “35” year old golden retriever to cool her down every morning by lightly spraying cold water in her belly all the way to the sternum, except during her “bath day” which is twice a week during the summer. Her bowl is filled with cold water and sometimes chew small ice cubes as a treat. Instead of walking her on sunny mornings, we do it at night. I think she will probably choose also the air conditioner over her chew toys if given the chance to. She will stay all night long outside our bedroom to feel the cold air passing through the sill and sneak as fast as she could to enter the room the moment me or hubby opens the door. Silly girl! MM, since I’m having trouble keeping my weight down, what I drink is just iced water (lotsa ice) with quartered strawberries and lots of torn mint leaves. No sugar. It’s my imaginary mojito and just sip on it throughout the day. Berry refreshing! Looks so pretty, too. Add Rum and Grand Marnier and its Good to go!! Wow, time to beat the summer heat..
Hi MM. This is how much of a ‘fan’ I am… in bed with the flu yet i still turn on my ipad so i can check your site. LOL. I hear indeed from my family there how terrible the weather is right now and that my mom simply refuses to go out at the moment. Hubby and I even had plans to go there next month but due to the weather, we’ve scratched all that. Anyway, just forwarded a link of this post to my brothers so they too can get some ‘juicy’ relief from the heat! Early to market, means lots of worms…heehee.